Rhododendrons, like many other plants, are susceptible to a number of diseases. And most of them are caused by fungal infections. These fungi may live in the soil in your yard, or they may have been present on your rhododendron when you purchased it from the nursery. Healthy rhododendrons can resist fungal infestation. But when your plant is weakened by inadequate care or inclement weather, it becomes susceptible to attack. But before you treat your rhododendron, take a sample of the infection to your local county extension office or the experts at your local gardening center for identification. Many plant diseases look alike and you want to make sure that you’re treating the right one. Cure stem die-back with aggressive pruning and fungicide. Stem die-back is caused by the fungi phomopsis and botryosphaeria that also thrive in puddled, waterlogged soil. Rhododendron affected with stem die-back will have one or more limbs that suddenly wilt. Rhododendron suffering from the early stages of stem die-back may be saved if all infected or dead tissue is pruned promptly and any debris at the base of the plant is cleared away. Cut at least 1 inch into the healthy tissue to be sure that you have pruned away all of the fungus. Disinfect your pruning shears with rubbing alcohol and rinse them off with water in between each cut. 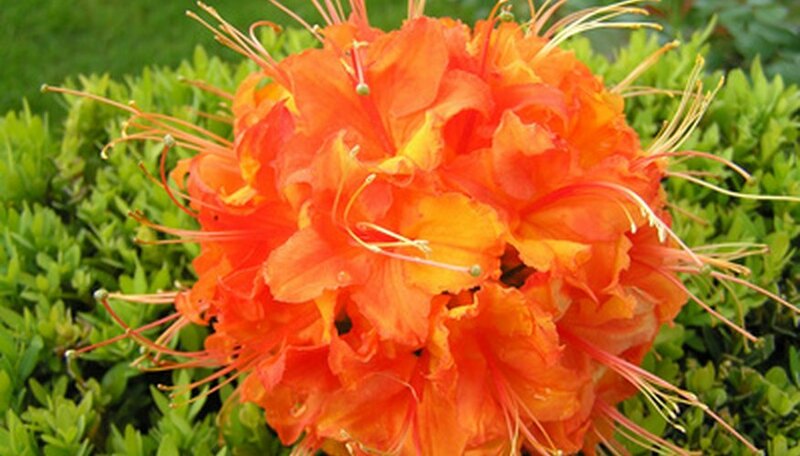 Spray the rhododendron with Subdue or another fungicide labeled for the treatment of die-back in rhododendron. If the plant dies despite your efforts, raise the planting bed before replanting to improve the soil's drainage. Cure powdery mildew by pruning all of the affected tissue. Powdery mildew first manifests itself as light green or yellow spots on a rhododendron's leaves. As the fungi multiply they will cover the leaves in what looks like a powdery coating. Particularly virulent infections can be sprayed with a fungicide labeled to treat powdery mildew like Benlate or Bayleton, but this is rarely necessary. Cure bud blight by pruning affected buds. Rhododendron buds attacked by this fungus will turn brown and develop black bristles which are fungal spores. Fungicide is not necessary. Cure flower blight by pruning affected tissue, clearing leaf litter and spraying with a fungicide prescribed for use on rhododendron that contains benomyl or triadimefon. Rhododendron flowers afflicted with the flower blight fungus develop waterlogged spots before they become soft, brown and wilted. To be effective, the fungicide must be sprayed on rhododendron flower buds as soon as they begin to show color. Cure leaf rust by pruning away the infected leaves. Rhododendron leaves affected with leaf rust develop rust-colored spots. Root rot can be caused by a number of soil-borne fungi that thrive in puddled, waterlogged soil. Affected plants turn deep brown at their base and the coloring will slowly move up the plant tissues. But by the time the signs are visible it is often too late to save your plant. You will likely have to uproot the dead rhododendron and plant the new plants in raised beds that provide better drainage. Fungicides may be applied to the soil as a preventive measure. However, chemical control largely depends on the fungi responsible. Contact your local county extension office and correctly identify the fungi responsible before applying any fungicides.